Originating from a dream had by CEO and founder Dr. Marcus Weller, the AR-1’s main features are GPS navigation and a rearview camera. This information is presented via a heads-up display (HUD) in the bottom right corner generated approximately ten feet in front of the rider with an infinitely variable focal distance. 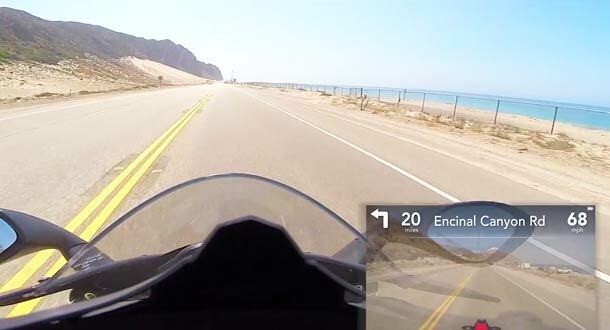 The HUD is enhanced with the company’s Synapse Vision Enhancement platform, which allows information to be displayed with perfect clarity no matter where the rider is looking. The rearview camera offers a 180 degree panoramic view for optimal awareness and safety. The helmet is connected to a smartphone via Bluetooth and supports hands-free calling as well as text notifications and music streaming. In addition, it features Internet connectivity and over-the-air software updates for downloading new features when they are released. Synapse is open SDK, allowing users to develop custom apps that expand the helmet’s functionality. With full certification from both the DOT and ECE, the helmet functions well as a helmet (as it should). The visor is fog-resistant, scratch-resistant, glare-resistant and features E-Tint technology for adjusting tint settings to improve visibility during varying weather and road conditions. The company has stated that the helmet will be available in many sizes, ranging from S to XXL, in addition to having interchangeable padding inserts. Originally introduced in late 2013, the AR-1 generated over 100,000 beta tester applications, prompting the launch of an Indiegogo campaign in August of this year. The company’s stated goal of $250,000 was easily exceeded, with over $1.3 million raised before the campaign has even reached the halfway mark. It is planned to end in mid-September. The AR-1 is currently available for preorder at a price of $1,399, or $1,499 for included international shipping and $1,999 for a Signature Edition that is hand-numbered and signed by the CEO. MSRP is expected to run $1,499.